Saint Francis is well known as the patron saint of animals, but here we are focusing on exotic animals and the people who study and care for them, such as zoo keepers who take care of God’s incredible creatures from all over the world, so that people have a chance to see living examples of beautiful animals they would otherwise never come in contact with in their lifetime. Herpetologists study and care for exotic reptiles such as snakes and lizards. Some of these can be quite dangerous and require great respect. 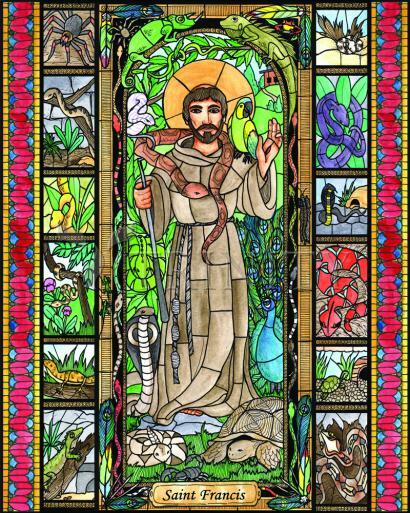 We pray that Saint Francis, with his great love for all creatures, watch over these brave people who work with these beautiful animals. Working with exotic animals is an art within itself, and takes special people who imitate Saint Francis' love for all of God's creatures, no matter how dangerous they might be. Father Francis and his companions were making a trip through the Spoleto Valley near the town of Bevagna. Suddenly, Francis spotted a great number of birds of all varieties. There were doves, crows and all sorts of birds. Swept up in the moment, Francis left his friends in the road and ran after the birds, who patiently waited for him. He greeted them in his usual way, expecting them to scurry off into the air as he spoke. But they moved not. Then he gave them his blessing, making the sign of the cross over them. At that they flew off and Francis, rejoicing and giving thanks to God, went on his way. Later, Francis wondered aloud to his companions why he had never preached to birds before. And from that day on, Francis made it his habit to solicitously invoke all birds, all animals and reptiles to praise and love their Creator. And many times during Francis’ life there were remarkable events of Francis speaking to the animals. There was even a time when Saint Francis quieted a flock of noisy birds that were interrupting a religious ceremony! Much to the wonder of all present, the birds remained quiet until Francis’ sermon was complete. One day a brother brought a rabbit who had been caught in a trap to Saint Francis. Francis advised the rabbit to be more alert in the future, then released the rabbit from the trap and set it on the ground to go its way. But the rabbit hopped back up onto Francis’ lap, desiring to be close to the saint. Francis took the rabbit a few steps into the woods and set it down. But it followed Francis back to his seat and hopped on his lap again! Finally, Francis asked one of his fellow friars to take the rabbit far into the woods and let it go. That worked. This type of thing happened repeatedly to Francis—which he saw as an opportunity to praise the glory of God. If the simplest creatures could be so endowed with God’s wonder, how much the more so we humans! Fish were also known to obey Francis. Whenever a fish was caught and Francis was nearby, he would return the fish to the water, warning it not to be caught again. On several occasions the fish would linger awhile near the boat, listening to Francis preach, until he gave them permission to leave. Then they would swim off. In every work of art, as Saint Francis called all creation, he would praise the artist, our loving Creator. Perhaps the most famous story of Saint Francis is when he tamed the wolf that was terrorizing the people of Gubbio. While Francis was staying in that town he learned of a wolf so ravenous that it was not only killing and eating animals, but people, too. The people took up arms and went after it, but those who encountered the wolf perished at its sharp teeth. Villagers became afraid to leave the city walls. Francis had pity on the people and decided to go out and meet the wolf. He was desperately warned by the people, but he insisted that God would take care of him. A brave friar and several peasants accompanied Francis outside the city gate. But soon the peasants lost heart and said they would go no farther. Francis and his companion began to walk on. Suddenly the wolf, jaws agape, charged out of the woods at the couple. Francis made the Sign of the Cross toward it. The power of God caused the wolf to slow down and to close its mouth. Then Francis called out to the creature: “Come to me, Brother Wolf. In the name of Christ, I order you not to hurt anyone.” At that moment the wolf lowered its head and lay down at Saint Francis’ feet, meek as a lamb. The wolf showed its assent by moving its body and nodding its head. Then to the absolute surprise of the gathering crowd, Francis asked the wolf to make a pledge. As Saint Francis extended his hand to receive the pledge, so the wolf extended its front paw and placed it into the saint’s hand. Then Francis commanded the wolf to follow him into town to make a peace pact with the townspeople. The wolf meekly followed Saint Francis. By the time they got to the town square, everyone was there to witness the miracle. With the wolf at his side, Francis gave the town a sermon on the wondrous and fearful love of God, calling them to repent from all their sins. Then he offered the townspeople peace, on behalf of the wolf. The townspeople promised in a loud voice to feed the wolf. Then Francis asked the wolf if he would live in peace under those terms. He bowed his head and twisted his body in a way that convinced everyone he accepted the pact. Then once again the wolf placed its paw in Francis’ hand as a sign of the pact. From that day on the people kept the pact they had made. The wolf lived for two years among the townspeople, going from door to door for food. It hurt no one and no one hurt it. Even the dogs did not bark at it. When the wolf finally died of old age, the people of Gubbio were sad. The wolf’s peaceful ways had been a living reminder to them of the wonders, patience, virtues and holiness of Saint Francis. It had been a living symbol of the power and providence of the living God.